Sonoma County’s Alexander Valley was mostly prune orchards and pastures when, in 1962, Maggie and Harry Wetzel purchased a large portion of a homestead built by Cyrus Alexander, the valley’s nineteenth century namesake. Here, in a rural community of family farms and ranches, the Wetzel family settled. They raised livestock, cultivated bountiful gardens and restored Alexander’s original home, making it the center of family life. With an eye to their neighbors in nearby Napa Valley, the Wetzels boldly planted premium grape varieties, among the first in the area. Then the family built a small winery and Hank Wetzel, oldest son of Maggie and Harry, produced Alexander Valley Vineyard’s first wine in 1975. His wife Linda set up the books and managed the winery office. 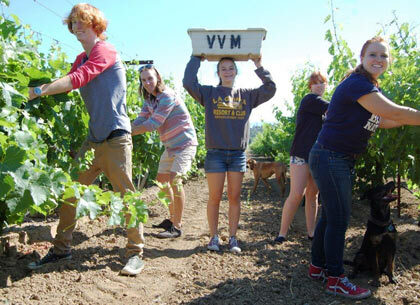 AVV quickly established a reputation for estate grown wines with distinctive varietal character. Acclaimed for luscious Chardonnay and elegant Cabernet Sauvignon, Alexander Valley Vineyards brought recognition to the appellation and became a leading winery in Sonoma County. 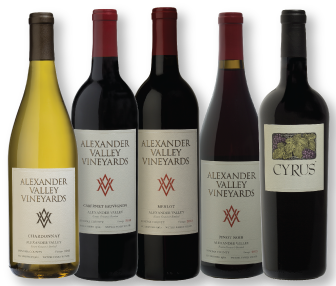 Today the Alexander Valley is a prominent appellation known worldwide as the source of rich, age worthy wines. As the twenty-first century begins, the Wetzel Family Estate grows fourteen grape varieties, on diverse sites stretching from the banks of the Russian River up onto the hillsides. Each grape variety is matched to a specific soil type and exposure. Vineyard Manager Mark Houser and Winemaker Kevin Hall work as a team to maximize fruit flavor in the vineyard and to create balanced wines that capture the grapes’ varietal characteristics. 2015 marks the family’s 53rd year on the historic property and will be the winery’s 41st vintage. The 3rd generation of the Wetzel Family produces award winning wines that are sold throughout the United States and was voted Sonoma’s Best Winery in 2011 by Bay Area wine lovers. Cabernet Sauvignon, Chardonnay, and Merlot constitute over one-half of total production. Other varietals include Zinfandel, Pinot Noir, Sangiovese, Cabernet Franc and Syrah. Proprietary wines include CYRUS, their limited production Bordeaux style blend, Gewurz, and trio of Zins: Temptation Zinfandel, Redemption Zinfandel and Sin Zin, their voluptuous Alexander Valley Zinfandel. Please join us for a Winery Spotlight tasting, featuring AVV wines.